Our engineering knowledge in the design, development and manufacture of water pumps for diesel engines is considerable with over 100 years accumulated knowledge of the product and its applications, our experience covers diesel engine from 1.5 litres through to 65 litres. 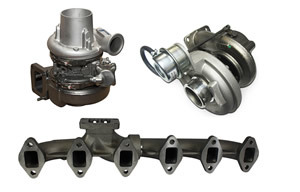 Our water pumps are designed for the particular model of engine you have, each one has undergone extensive testing and evaluation to ensure it works time after time and delivers the right amount of coolant flow to effectively cool your engine. 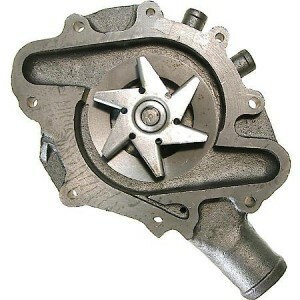 The role of a water pump in an engine is primarily to regulate its temperature and to prevent an engine from overheating. It pumps water and coolant through the engine block and cylinder head via a series of pipes, drawing out the heat generated, before going into the radiator. The coolant temperature should not exceed 110 Deg C to prevent damage to the engine internal components. Water pumps tend to be highly reliable components, the recommended inspection/maintenance interval is once every 2,000 hours of service. Expectation is that you would expect them to last between 8,000-10,000 hours but occasionally they can malfunction. 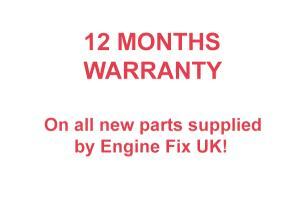 In the unlikely event of failure replacing them is straightforward and Engine Fix UK offer a comprehensive range for your needs. Regular maintenance by replacing the pump before it fails can prevent your engine from overheating, seizing up and ultimately suffering expensive failures. 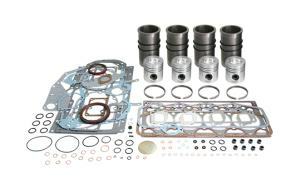 Our water pumps include with them all the gaskets and seals required to fit the water pump to your engine. Engine Fix UK ensure that we optimise our pumps to yield the correct coolant flow and pressure to ensure adequate cooling of your engine. This is achieved by using the correct impellor shape and design, impellor size, smooth surface treatments and correct drive ratio using pulley/gear ratio. Our pumps include the following design features. 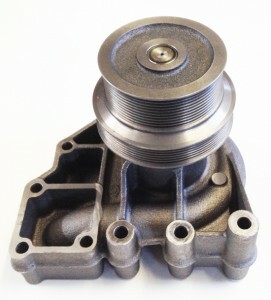 The water pump will either be driven via a pulley either mounted directly on the water pump shaft or a stamped steel pulley bolted to a hub again on the water pump shaft, on early engines the pulley is normally a single or twin vee-groove, for later engines with the introduction of poly vee-belts multi grove pulleys are now used. With the advent of tighter emissions regulations later generation engine were designed with the water pump drive a gear in the main engine drive train. 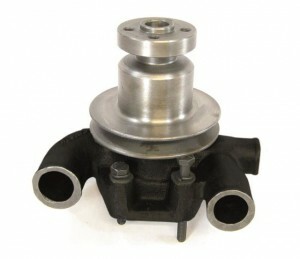 The rear of the water pump will have an impeller fitted, this item pumps the water around the engine, the impellor materials is cast iron although with the drive for greater flow and improved efficiency water pumps impellors are now made out of stamped steel, glass filled nylon or resinoid materials. The impellor and drive line loads are taken by the use of bearing, which can be one of several different types dependant on the design of the water pump. 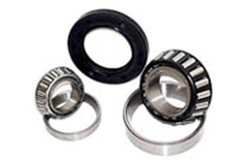 For small or older diesel engines generally the bearing fitted is an integral shaft bearing which contains both the ball roller bearing arrangement around a spindle, the bearing is sealed for life. 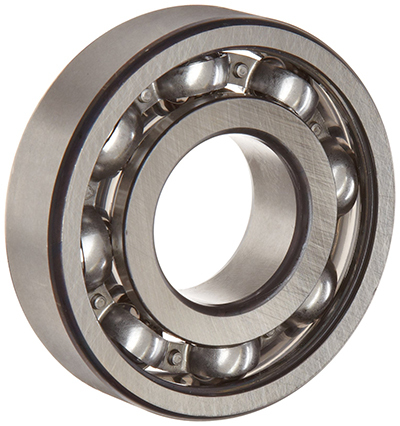 This bearing is used because of their advantage in terms of cost simplicity and performance. Although in recent years integral shaft bearings have been developed with larger cage diameters to support higher load. 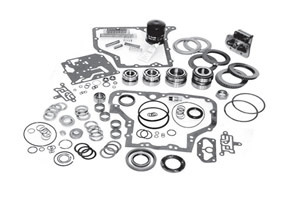 In large water pumps fitted to older engine the bearings are normally a pair of deep groove ball bearings with spacing between them set by a distance piece with the bearings mounted on a hardened steel shaft. Again the ball bearings are sealed for life using synthetic seals at either end of the bearing to provide positive sealing at all times and preventing the ingress of dirt. Where high axial and radial loads are encountered tapered roller and angular contact bearings are used. 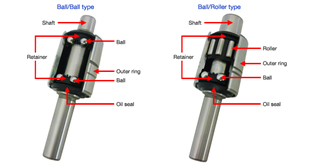 Divided into 2 types by internal features; double-race-ball type(ball/ball) and ball/roller type. Load resistance is the principal difference of "ball" from "roller". "Ball" locating on a "spot" excels in low noise at high speed. "Roller" in linear support endures more radial load and increases load rating. "Roller" is preferred in driving pulley and/or when a load, such as a fan coupling, is installed at off-set position in front. A water pump seal is used to seal off the water passageways of the water pump from the bearing arrangement, in early designs of water pumps the water pump seal was two separate parts, the rotor being fitted in/on the impellor and the stator was fitted in the water pump housing, these seals were generally unreliable and the seal industry developed the cassette seal. The seals initially were available in rubber or stainless steel. 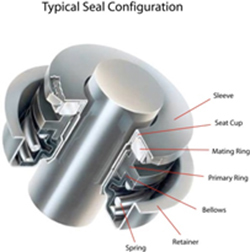 The advantage of using this seal is that it is a sealed unit which can be leak tested and also cannot be contaminated with foreign matter on assembly into the water pump. The inner sleeve is in permanent contact with the shaft stopping the possibility of coolant passing between the impellor and shaft. The rubber version of the cassette seal requires the impeller to compress the seal to the correct working height, the steel version is assembled in the water pump by using a fixed assembly tool. Engine Fix UK fit all our pumps with the steel cassette type seal to give to our customers the optimum seal performance to ensure long life for the water pump. 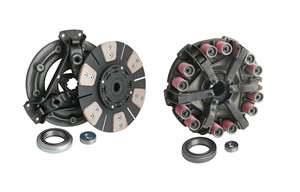 The cassette seal materials can be optimised depending on the water pump application. Normally the rotor material of the seal with be ceramic, although where long life is required a silicon carbide option can be offered. For the stator part of the seal this is normally hard carbon although again if the water pump is working under extreme conditions a silicon carbide can be offered. For gear driven pumps the cassette seal adopts a positive drive approach to ensure that the seal can cope with the gear torsional activity without failure. The rubber elements within the steel are normally HNBR material but again for higher temperatures a HSN material can be offered. 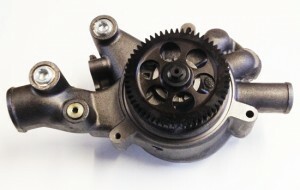 The indication of seal failure in the water pump is initially identified by coolant loss from the weep hole in the housing, if this water loss is ignored ultimately the seal will move to failure with loss of water/coolant form the cooling system and overheating of the engine should the temperature warning gauges/switches are ignored.